Today’s post is not so much about the car. After all - what is there left to say about the Skyline? Today is about the weird stickers you sometimes find on Japanese diecast of the early 1970s. In my younger years, I resolutely removed all stickers from models - I liked them as plain cars. And this sort of thing would have found no mercy with me - that Skyline would suffered the same fate. I see things a bit different now, as they now seem to me as relics of a certain time and place. And that time and place was the Japan of 1972 or 1973. For whatever reason, both Tomica and Diapet decided it was time to bring out diecast models decorated with stickers from the popular TV Superhero shows of that era. This 1/40 scale Diapet model carries the image and insignia of the “Ultraman Science Guard Members” - the show being the usual fare of good guys in spandex suits and rubber masks fighting bad guys in spandex suits and rubber masks. The cars were actually not associated with the shows at all - it was just the stickers that linked them to the TV shows. 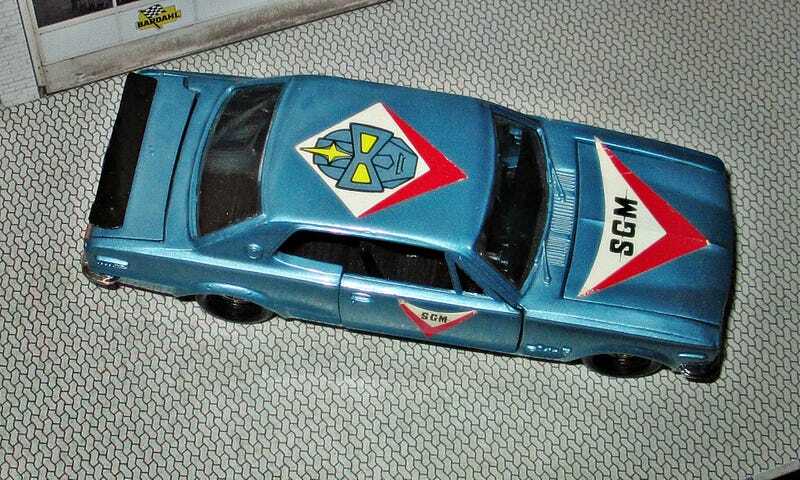 Other models produced included a Mitsubishi Galant in “Warrior of Love Rainbowman” livery, a “Devilman” Toyota Crown Hardtop, and a “Barom 1" Toyota 2000GT. Nostalgia makes everything look better, so I’m definitely leaving the stickers on this one. And now, let’s see if Ricciardo can improve on his 6th place in qualifying at Monaco. A bit hard though without overtaking.